I'll be taking a break from my regularly scheduled winter outfit posts because Stan and I are currently in Palm Springs for the week! *insert hands up emoji* As soon as we landed, the sun was shining and we both couldn't wait to get outside and explore. After leaving snow and 20 degree temps, we were itching to spend as much time as possible outside. This particular post was shot in the Old Las Palmas neighborhood right near the Palm Springs Design District and the homes were so beautiful and colorful. 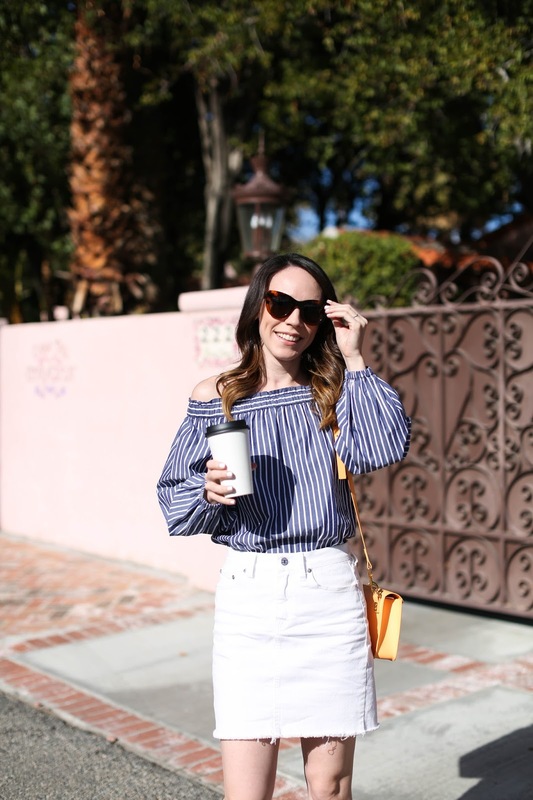 I'll be sharing what we did, where we stayed, etc early next week, but for now I wanted to put up this outfit post because I couldn't wait to wear this off the shoulder top! I had seen it on the J.Crew site in December but it sold out during the holiday sales, and I was so bummed. However, right before I left for Palm Springs, I checked the site again and it was restocked in all sizes! 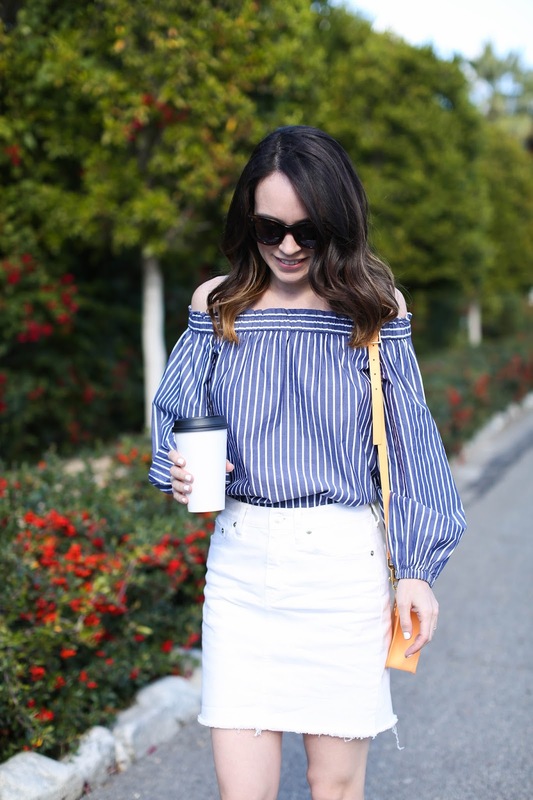 I love an off-the-shoulder style, but I don't see too many with long sleeves which makes it a great transition piece. 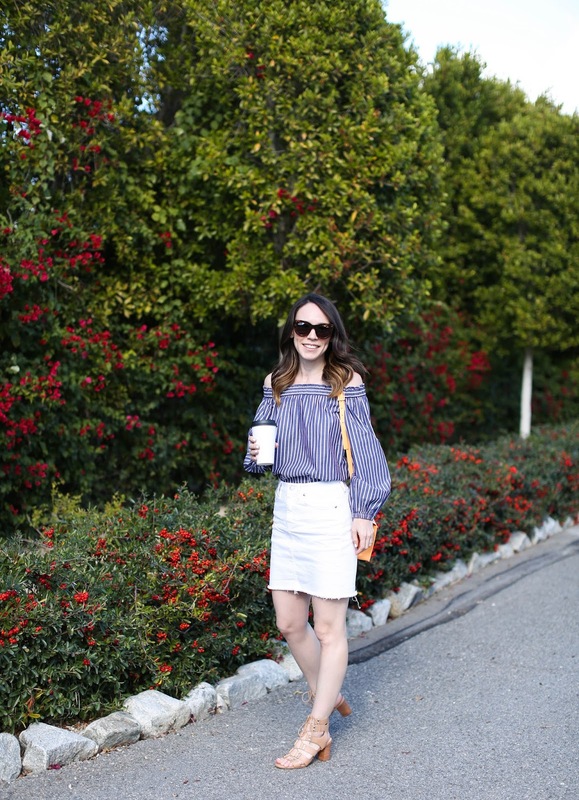 This white denim skirt is another J.Crew find from earlier this year, but I cut off 2-3 inches and love the shorter look a bit better than the original knee length. Finally, these lace-up sandals were a must have for this trip because the block heel makes them so comfortable to walk in. I also love that they are mix between a sandal and a bootie which makes them suitable for other seasons than just summer. I'm dreading our trip back to the cold weather, but we still have a few more days out here so I will be soaking up every bit of sunshine and warm weather that I can!